Well. That OTW Open Board meeting happened. And then things continued to happen. Now that things have settled down just the tiniest bit (most likely because most of the US based people are in a food coma), I am with the people who think this clean slate is actually the best news for the org. I trust LO and Matty and I know they are already working hard to get everything lined up so they can start work as soon as they are inducted as Board. I've also been sucked into Hamilton because of course I would. Thanks to us being fully staffed vet-wise at work for the first time in five years or so, I was barely working at all in November. I am not used to this. It took me about two weeks to remember that I choose a job with 60+ hour weeks for a reason. I need the stress and pressure. Without it I actually get less done. Oh well, from December on we're back to a more normal rota pattern, then I can be grumpy about too little sleep and/or time again. We've reached the season where all my running trails are mud and ice again. This is not conductive to running at any reasonable pace, but then the weather itself is rarely inviting to go out on any business anyway. I try to keep up the running nonetheless. Next half marathon in March is the plan for now. We shall see. At least I've made it through the first two weeks or so I think. That's a start? 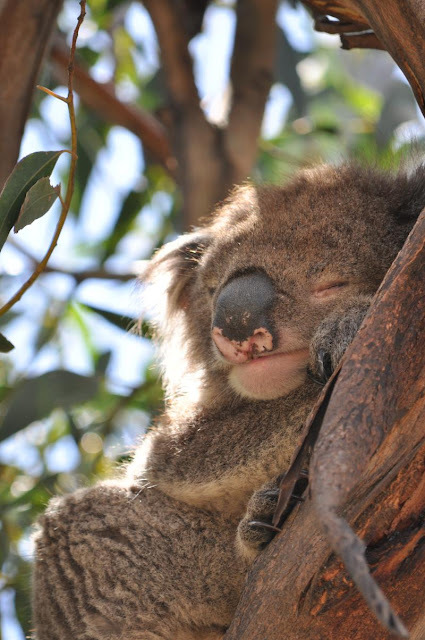 Aww, that is a sweet Koala sleeping! Thank you for that lovely picture.